I’ve decided to work on a new direction for a bit. Art is one part creative prowess, one part skill, and one part identity. Its that identity that gives art its voice, passion, and unique character. Playing off this, I’m working to do a series of pieces focused identity. More specifically, my own personal background as a Texan & American of Palestinian descent. The first part of this series is a portrait of the progenitor of the family – Salem. Salem was a classic Levantine merchant. In family lore he is half myth, half reality – rumored to have traveled the world in the early 20th century sponge fishing in Australia, buying spices in southeast asia, and dropping into New York City and Palestine to visit his children and relatives. His final resting place – like his life really – is mostly unknown. Anyways, here is a portrait based off an old photograph we had of him. I’m not sure how I feel about it. Any comments? Suggestions? As always, enjoy. This entry was posted in Uncategorized and tagged acrylic, acrylic art, acrylic paints, acrylic portrait, adam, adam chamy, adamchamy, australia, district of columbia, expressionistic, identity in art, mixed media, mixed media portrait, palestine art, palestinian art, palestinian identity, portrait, portraits, portriature, salem, salem chami, salem chamy, salem shami, sponge fishing, update, washington, work. Bookmark the permalink. Very interesting! 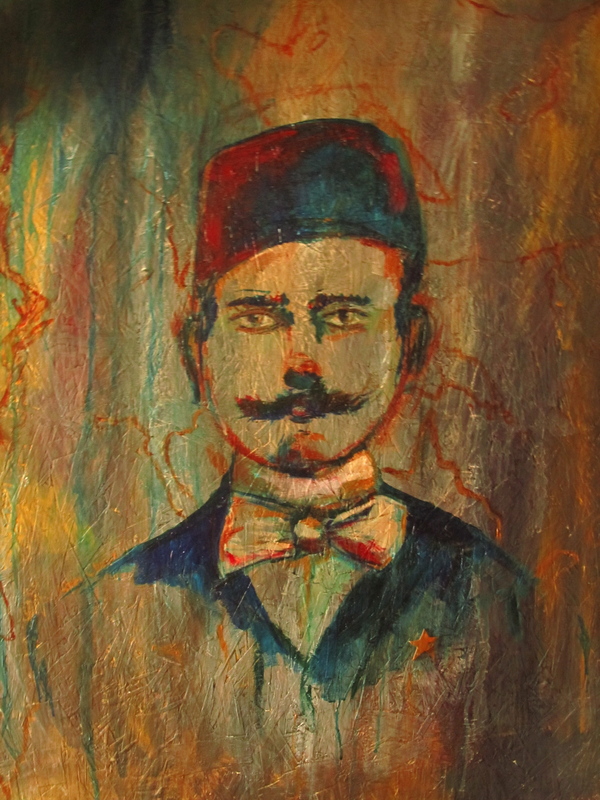 Looks very much like a colonial-era indian Babu, the mix of the hat with bowtie… very different from what I’m used to seeing from you, but love the idea of painting on plywood! yeah, I think the Babu reference makes a lot of sense. The photos I worked from of him were taken during the British mandate period (so maybe 1920s?) when the fez was still a fad in the Near East and formal wear was doned throughout the British empire from India and Malaysia to Palestine. He was very much a denizen of that era.